He is called the ‘Evergreen’ superstar of Indian Cinema. Dev Anand started his film career in the 40’s and today, even after six decades, he’s still active and busy working on his films. In his autobiography, ‘Romancing With Life’, Dev Anand shares how the events in his life made a boy from Gurdaspur a star of the Indian Cinema. IndiaFM will run a series of excerpts from Dev Anand’s autobiography marking some of the most fascinating incidents of the superstar’s life. This entry was posted on Wednesday, October 31st, 2007 at 11:05 am	and is filed under Web. You can follow any responses to this entry through the RSS 2.0 feed. You can skip to the end and leave a response. Pinging is currently not allowed. ONLY FOR KISHORE DA BUT IT WAS UNFORTUNATE FOR ALL MUSIC LOVERS ACROSS THE GLOBE WE DIDNT HAD KISHORE DA WITH US AT THAT TIME DUE TO HIS UNTIMELY DEATH. IF KISHORE DA WOULD SUNG THE SONG “EK LADKI KO DEKHA TO AISA LAGA” IT WOULD HAVE BEEN A REMARKABLE AND LANDMARK SONG OF INDIAN MUSIC INDUSRTY. I SALUTE TO KISHORE DA-R.D-BURMAN CHEMISRTY. THERE SONGS ARE EVERLASTING ANG GOLDEN THAT ARE LOVED BY MILLIONS ACROSS THE GLOBE. i know kumar sanu couldnt have a better job than kishoreda on the songs in 1942, but at the time and still is the best the bollywood playback has got to offer in this generaton of singers. sanuda spent his life imitating kishoreda but i knw he could never be ever take the place of kishorda in our hearts and i knw of sanudas as well. What you said is great! Kishoreda-Rdburman chemistry is awesome. Wow it would have been great if kishoreda would have sung “EK LADKI KO DEKHA TO AISA LAGA”. It is ONLY Kishoreda who can bring the TRUE feelings in songs. kishore da would have completely dominated the playback industry in the 90’s as well even his son amit kumar was getting lots of offers from the film makers to sing in there films but he refused gently,coz he didnt want people to compare him with his immortal dad’s performances.He like millions of kishore kumar lovers across the world knew in his deep heart that there is only one kishore da,and singers like him come to this earth once in many centuries.AMIT KUMAR ONCE IN AN INTERVIEW SAID THAT HE DOES NOT LIKE A BLIND RAT RACE TO GET ACKNOWLEGED WITH THOSE FOOLISH CONTRACTS AND MEANINGLESS SONGS THAT ARE BEING SUNG BY THE LIKES OF KUMAR SANU AND OTHER SO CALLED SINGERS . Sadly, R.D.BURMAN lost his touch and his confidence. and the brilliance returned, fate snatched him away from us. to do a song for him. Very few people know these things. he has his own band of lovers everywhere. Kishore Kumar. This is Kishore da’s additional greatness. Rafi lovers or Kishore lovers may not compare the two legends. be enjoying the music of the legends of HFM . Remember such great songs will never be recorded again..
one song i can say now : ‘Din dhal jaaye , raat na jaaye”. his vocals. Both were integral parts of dev saheb. so enjoy your music irrespective of the singers is my view..
dear dev sahib, while we rafi sahib fans love kishore da also, can you clarify a few points? the movies which really gave you your suave , loverboy , image were kalabazaar, kalapaani, jab pyar kisise hota hai, cid, aslinaqli,love marriage, hum dono, bombai ka babu,pyar mohabbat,sharabi, maya, teen deviyan, and your greatest ever – guide. you were wonderful in these movies . the music was beautiful in these movies and helped you establish yourself in the minds as one corner of the famous trinity. HAVE YOU THOUGHT OF THE ONE COMMON FACTOR IN ALL THESE MOVIES – APART FROM YOURSELF ? THAT FACTOR IS MOHAMMED RAFI SAHIB. if what you say , and what the world unfortunately also believes – that kishore da was your voice, then how do you account for your best songs being sung for you by rafi sahib, and that to films under your own banner and music by sachin dev burman, probably the greatest music director this country will ever produce ? your last great musical was jewel thief which had a fabulous duet by rafi sahib and lata ji. like i said, we rafi fans love kishore da too, but lets keep and view things in the right perspective. When you talking of The Great Kishoreda, then don’t of imitators (its Sanu only). Sanu is forced made playback singer. There was huge vacuum created by untimely sad demise of Kishoreda. Unfortunate film industry got the shaky voice like Goat of Sanu and everybody ran after him like mad. After emergence of Sonu, Shaan and Shnkar Mahadevan tell me where he is? So Kishoreda is legend and nobody like him. But Kishoreda himself had great admire and respect to his fello singers. He is favorite singer of Great Lataji and verstile Ashaji. It was greatest show on earth on the greatest legend & Super Star Rajesh Khanna special on 14.3.2008 has proved to be the Greatest and Best show of K for Kishore. All participants sang very well and moreover, they choosen the best songs from Super Star Rajesh Khanna’s films. I once again made an appeal to SONY TV that our SUPER STAR RAJESH KHANNA should be the REGULAR CELEBRITY JUDGE in future eipsodes OR ATLEAST IN THE FINAL EIPSODE. Rajesh Khanna got the best songs of Kishore Kumar, followed by Dev Anand. I loved that RK-RDB-KK combination! I missed the show of K for Kishore of Rajesh Khanna special due to power cut problem. Could anyone let me know where can I get original DVDs of this show? hi friends, how could i see the episodes of k for k for the month of march on you tube or yoodleeyoo.com ? for dev sahab and kishore da combo i would say “ever green star with ever green voice. Wada.” we should not ignore these facts. R D burman has great songs with Rafi also “O H Hasina Zulfon Wali , Gulabi aakkhen “. People ignoew these facts. Yes’ I agree with Mr. Binu Nair’ we do not have any right to criticise or compare any one of them. Rafi Sahab & Kishore Da are the great legends.Both have different style of singing. Kishore was the best despite being an UNTRAINED singer. He gave life to his songs. He was a natural and there are very few like him. I was drawn to Hindi music because of Kishore’s songs. I wouldn’t have been otherwise. kishore da wasborn to give voice to first ever super star RAJESH KHANNA . Kaka popularity made Kishore da a great singer. 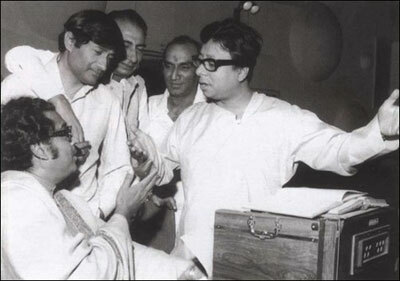 kishore da was born to give voice to first ever super star RAJESH KHANNA . Kaka popularity made Kishore da a great singer. To me Kshore Kumar is the greatest ever living legend. His voice quality,his versatility surpasses any other hindi singers. He blends his voice according to what a hero in a film requires. And this is is peculiarity. He sings with great feelings in his soul. And he has a manly voice on top of all others. Kishore Kumar was a singer whose voice mesmerized music lovers throuhout the country after 1970s, and he was a great singer, there is no speck of doubt about it. But in my opinion, with the advent of youtube after globalization, voices of four greatest legends, Md Rafi, Lataji, Kishoreji and Asha Bhosle are openly exposed to all music lovers, who have access to internet facilities. Having listened to all of them vigorously, I feel, it has become quite clear to music experts that Md Rafi and Lataji are definitely having edge over rest of the two in terms of divine voice quality and versatility. Notwithstanding the fact that female voices are not easily comparable to their male counterpart, it seems obvious to many of us that, even though Ashaji had a tremendous erudition in classical learning, she lacks the divin e touch of Md Rafi and Lata Mangeshkar. Kishore Kumar’s voice also had a tremendous range and timber, but in the final reckoning it seems Md Rafi and Lataji are ahead of him, since their voices were endowed with a divine gift, which yet to be emulated by any great singer till now. Kishoreda’s voice touches my heart and soul. No doubt in my opinion he is the best singer after god. Kishore Kumar will never Be born again.